Circle of Life | Nicole, Deipnosophist. I was raised in Indiana, but I was born in Charleston, South Carolina. We moved to Indiana before I was old enough to remember anything; however, we return to Charleston for vacation frequently and still have family friends here. Every time I come here, I feel a tug to live here. I applied for a job at a chemical company here and ended up not taking the job; I’ve kicked myself for that decision! I really feel at home here more than anywhere else. I always felt special to be born here. When people ask and I tell them, they invariably gush about a visit or experience of Charleston, and the charm it holds on them as well. I was born here because my dad had moved here for a job. My parents have mixed Charleston emotions. My dad was working a lot and my mom was alone with two children under 5 years old and a newborn baby (me). Despite the challenges, whenever our family visits here, there are more fun stories. I love to hear about my parents driving to the beach for the afternoon: they had three small children and enough gear to set up camp for weeks. I played in the sand or in a playpen. So when we decided to take a vacation, our little family of three decided to make the long drive to my home. 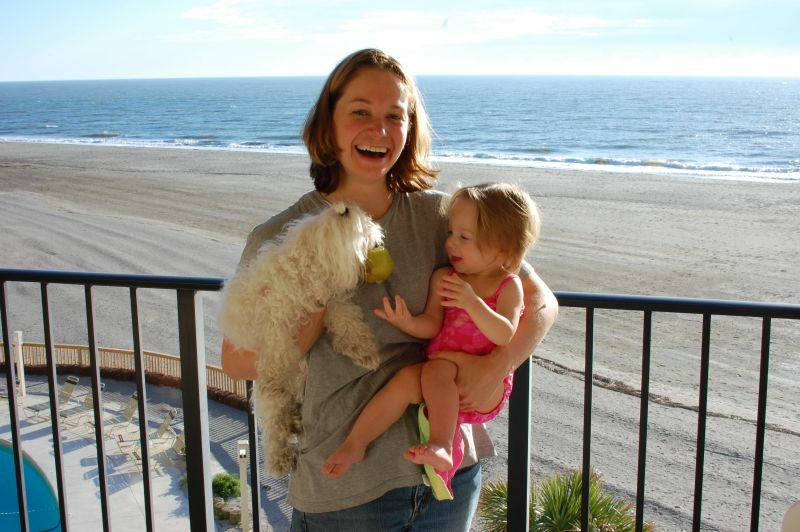 This picture was taken just a few minutes after we arrived in our seaside condominium after driving all night (I was relieved to have slept a whole hour). The scent of the marsh, the salt-corroded signs, the first view of the ocean- all of it hit me in a new way this year. Why? Because I have a daughter. This picture is typical- Ainsley loves to give Sunny treats! Today I took Ainsley for a 4k walk/jog along the path in the community where we stay (Sunny’s heart condition is too bad for her to make that long of a trip). I showed her other streets where we’ve stayed and I told her stories of those trips. 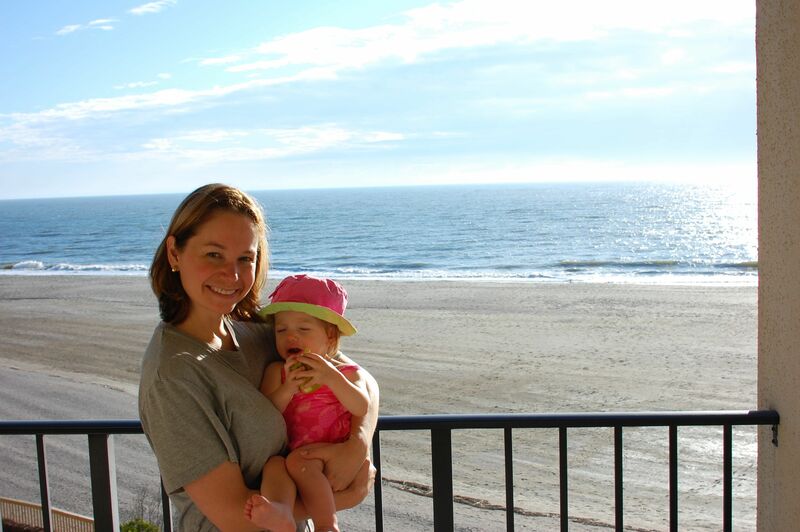 This afternoon, I took sweet Ainsley to the ocean for the first time. I didn’t realize how emotional it would feel. I realized that I was her age and I played on this very beach. I let her wander and collect shells and seagrass stems. She proudly showed me her finds and put them in a bowl. We sat on the beach and played. At one point, she giggled and gave me a big handful of sand, so proud to give it to me. 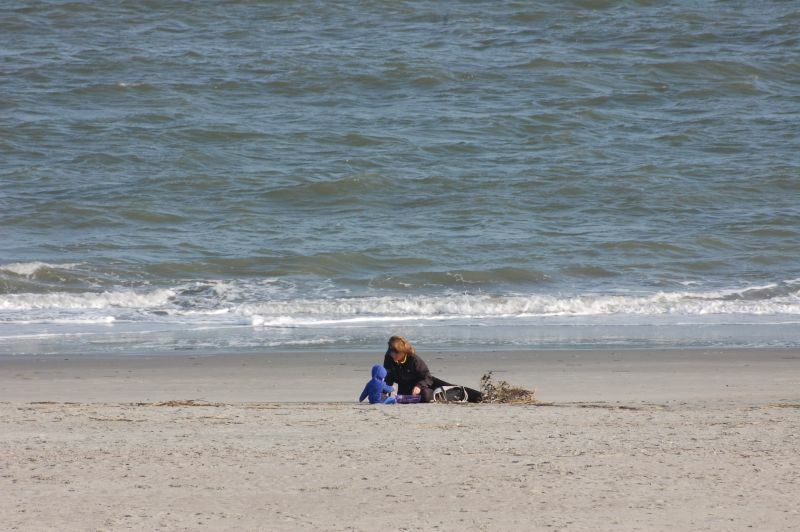 I took the sand but explained to her that this beach was not mine anymore- it belonged to her. As I said it, tears unexpectedly welled in my eyes. I wasn’t planning some big speech to her but when she handed me that little piece of beach I felt so much wistful joy. I always feel a bit insignificant when I’m in a natural setting and see the amazing beauty God gave us. But today? I was completely insignificant. I realized that I have passed the torch to the next generation, and that for the rest of my life, I will stand in the background while Ainsley takes over the world. I also realized that despite my insignificance on the stage, my part in preparing the new lead is far from over. Every parent must feel this sense of duty to show their child the world, and to give them a worldview that allows the child to grow and learn and become the next generation. My dear, sweet, darling daughter. I love you and I hope that I will have the privilege of standing in the wings and letting you take the world as your stage. Quick update at your house: No issues giving fluids, in fact got them in in two sticks. Since he didn’t move or make noise and seemed happy I just put in extra at each spot. Then both cat and bunny escaped briefly into the house but were collected successfully, fed, etc. Mr. Kitty was out of dish water and drank immediately when I filled the bowl, so I gave him a second one too. Both are doing fine!